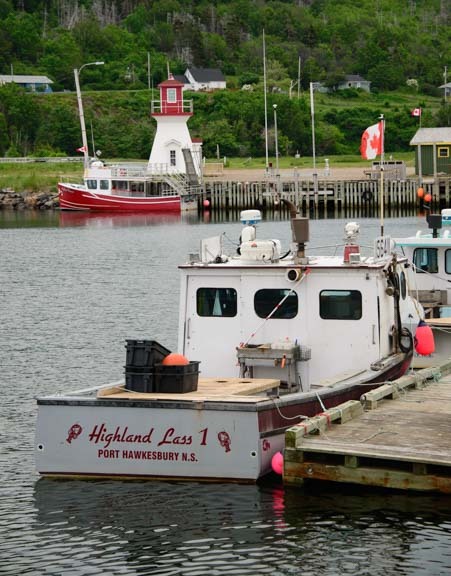 July 2015 – Nova Scotia is a big island, and we sampled some of the most scenic and quaint areas on the South Shore as well as on the Northumberland Shore. 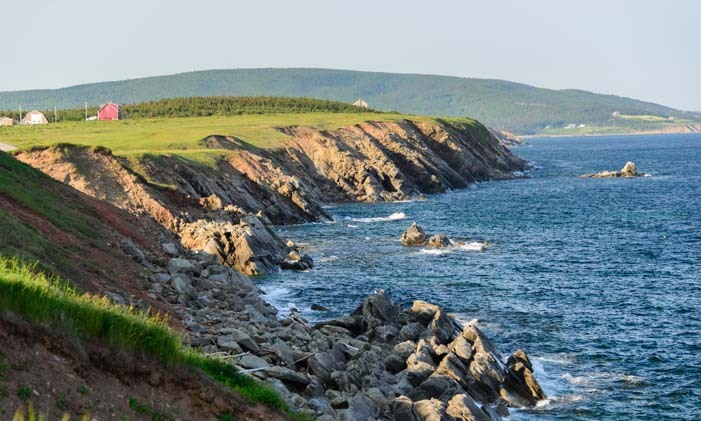 But Nova Scotia is probably best known for the Cabot Trail in the far northeastern corner that takes in the dramatic coastal views on Cape Breton Island. 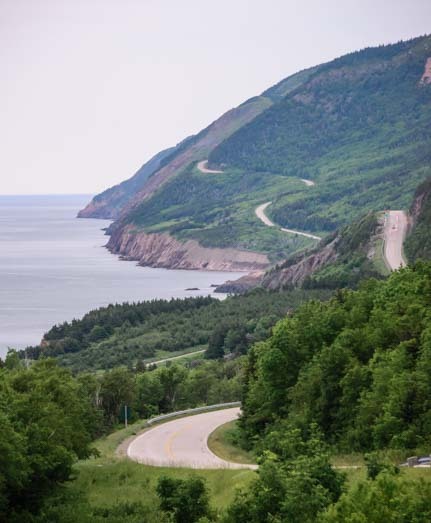 Many people tackle the 185 mile Cabot Trail scenic drive as a daytrip, starting at one of the more southern towns and driving around the loop either clockwise or counter-clockwise. We debated for a long time how to do this drive more slowly to take it all in. Where to start? Locals told us that the best parts were on the northwestern and northern parts of the loop. Which direction to drive? Seasoned travelers suggested we go counter-clockwise so we could be on the shoreside of the road the whole way. Could we take the buggy and park it somewhere and do shorter trips? Well, the Cabot Trail itself is has many sharp twists and turns and a rumored 23% grade somewhere. The road can also be quite rough, especially after a tough winter like this past one. In the end we decided to start from the French town of Cheticamp and to drive the truck by itself clockwise as far as we could manage in one day and then turn around and drive back. Just a few miles outside of Cheticamp the Cabot Trail became truly dramatic. The land rose up in steep hills and mountains, and sheer cliffs dropped off to the sea. The Cabot Trail clung to the edges of the cliffs offering us stunning views as we drove. It turns out that this is moose country, and no sooner did we turn away from the coast for a moment than we spotted a moose by the side of the road. It was early morning and the moose raised her head to check us out as we drove by. She watched us approach and stood stock still. Just as I got my camera aimed, however, she bolted and vanished into the forest. We hadn’t been on the road half an hour when we saw a live moose! But we didn’t get a great pic, so this will have to do! We stopped at Pleasant Bay to have a look around. 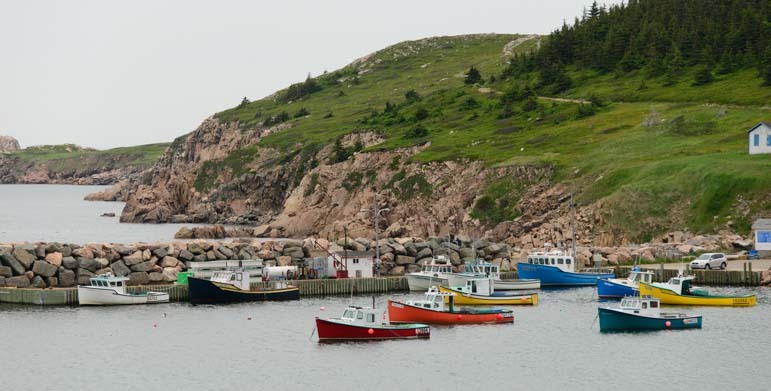 This is a small fishing village that is home to a fleet of colorful lobsterboats. Life was pretty quiet there in the morning hours, and not a soul was around. 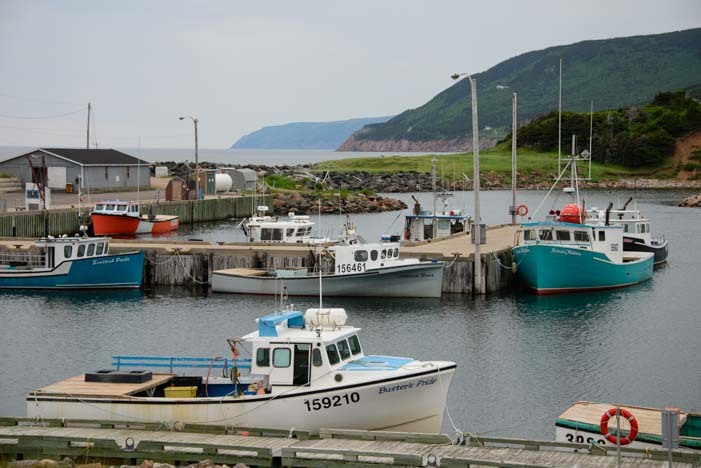 The Cabot Trail passes several quaint fishing villages. Pleasant Bay is lovely. We took a detour at the top of the island to explore some of the remote communities that dot the far northeastern end of Nova Scotia. As we drove the final miles of the little bumpy road into Meat Cove, we wondered if we’d taken a wrong turn somewhere, but when the view opened up we knew why the locals had sent us out here. It is spectacular! 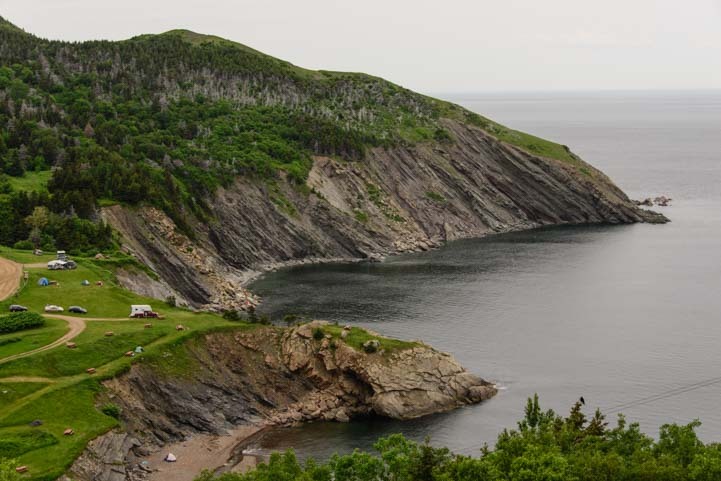 Gorgeous Meat Cove has a campground set high on these cliffs. There is a campground overlooking the water that seemed absolutely enchanting. 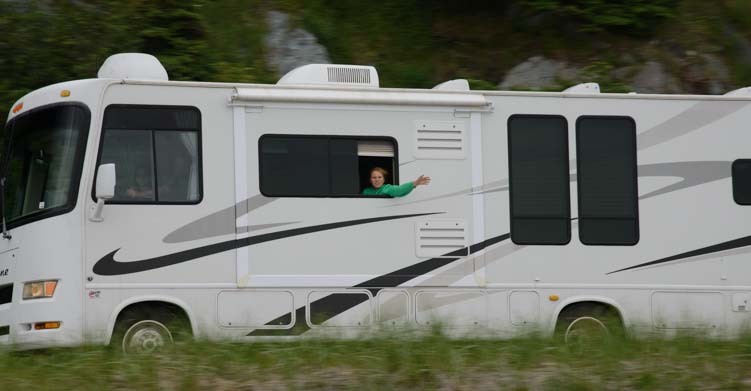 Our rig wouldn’t have fit, but for truck campers and popup tent trailers, a few days here would be a heavenly getaway. Now that’s a camping spot! 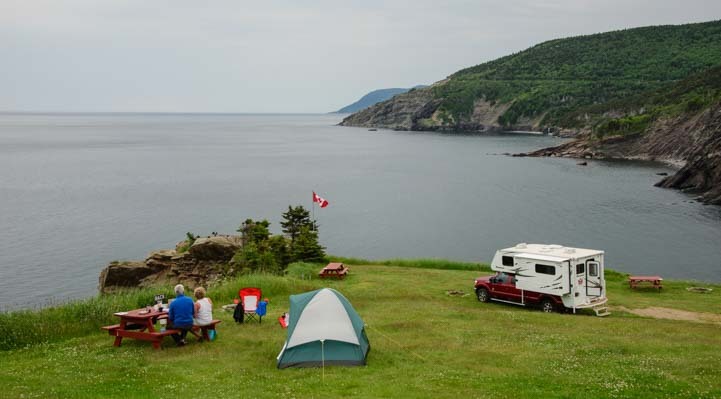 A popup or truck camper is ideal for this classic spot in Meat Cove. 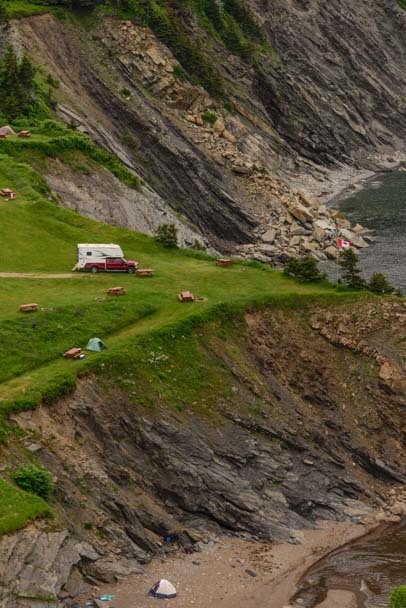 A picnic with your truck camper and a friend’s tent right there on the edge of a cliff overlooking the ocean — what an incredible spot to stay for a few days!! Right out of a brochure! We continued on the Cabot trail and stopped here and there to take pics of the views. At one stop we noticed a bunny watching us from beneath the protection of a bush. He quietly munched the grass and kept an eye on us while we crept closer and closer to get better and better portraits of him. We completely forgot about the view behind as we each took 100 bunny shots! 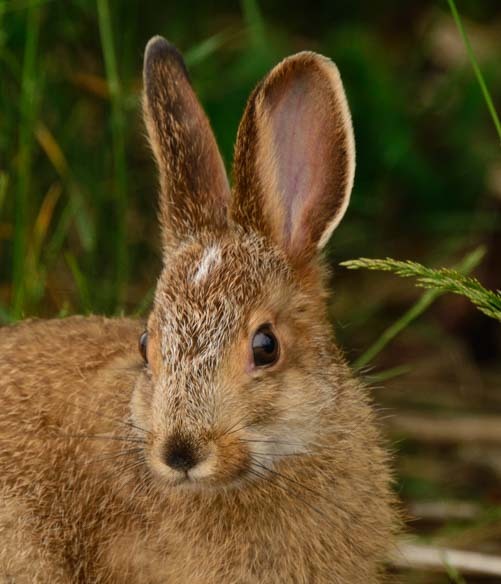 This little bunny had no fear of us at all! The road to Bay St. Lawrence lured us to a sweet fishing harbor filled with colorful lobster boats. Bay St. Lawrence is a charming small harbor. 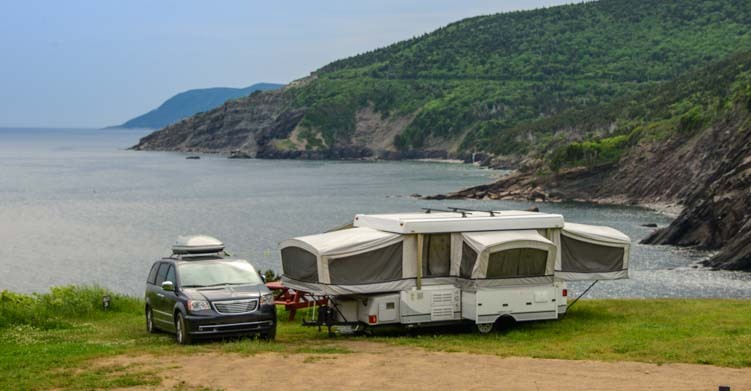 Back on the Cabot Trail, as we passed Asby Bay, we found ourselves driving alongside marshes and flat landscapes with the coastal mountains rising up in the distance. 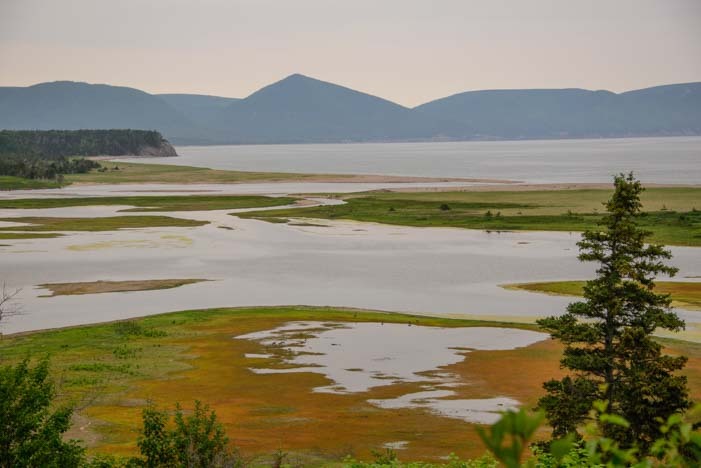 Traveling the Cabot Trail in the vicinity of Aspy Bay, we saw flat lands and salt marshes. Quaint fishing villages dot this entire coast, but perhaps the most lovely was the little harbor at White Point where the lobster boats were painted in primary colors. White Point is home to a fleet of colorful lobster boats. Neil’s Cove, just a little further on, was pretty sweet too! Cute Neil’s Harbor was our turnaround point. We turned around at this point and headed back to Cheticamp. 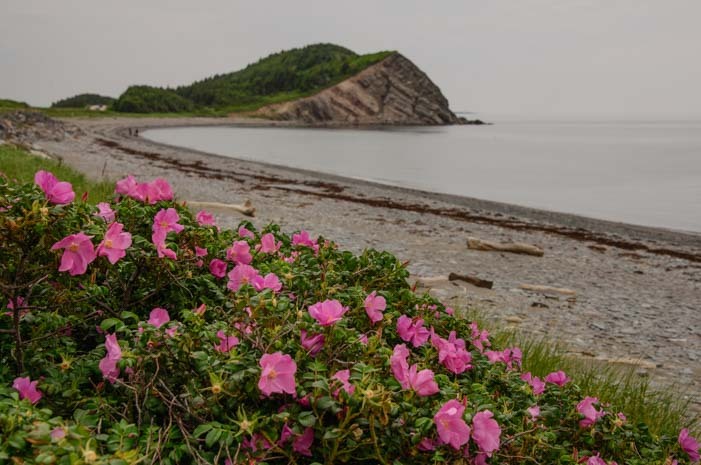 As we drove along the dramatic twists and turns just north of Cheticamp that make the Cabot Trail famous, we stopped and took a stroll on the fantastic pebble beach. Looking up towards the road, we saw an RV flying by. A young girl was grinning and held her hand out the window to wave at us! The stones and driftwood on this beach were very engaging. The perfectly flat shale stones were ideal for skipping, and there were enormous driftwood logs everywhere. 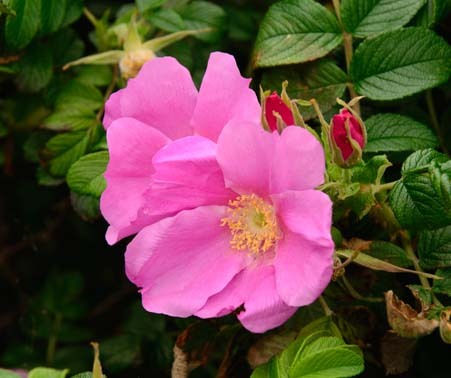 Between the beach and the road there were bushes that were just covered with vivid pink flowers, and as I began trying to work these beautiful flowers into my photos, I kept smelling an absolutely exquisite smell. Beautiful pink flowers filled the bushes near the beach. After a few minutes, I finally put two and two together and realized that the deliciously sweet aroma that kept wafting around me was coming from these flowers. They were beach roses! The flowers turned out to be roses. What a fragrance they had! Nova Scotia had given us some beautiful images, but we were ready to continue our journey. For the first time in months, we turned the buggy in a westerly direction! 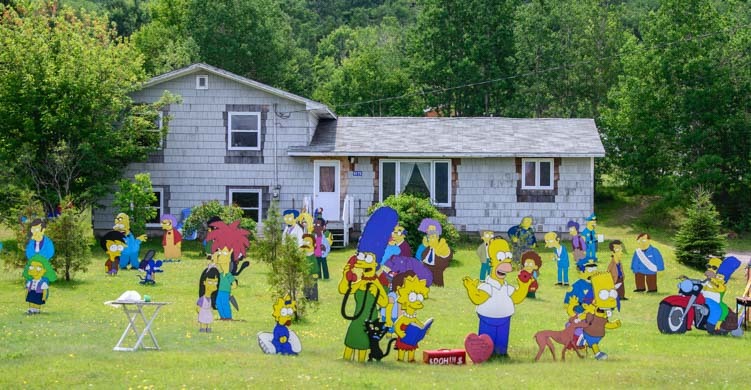 As we were leaving, the fun and crazy parting shot we got from this corner of the world was of a front yard filled with cut-outs of The Simpsons. What a hoot! Nova Scotia’s roads had been very hard on our rig. We have always had a funny way for judging just how bumpy a ride had been: after we parked the trailer, if we opened the trailer door and found the table leaning on one of our chairs, then it had been a rough ride! Out west this happened perhaps two or three times in a season. In Nova Scotia it had happened every day. We had reached the point where we put spare pillows on the chairs to give the table a soft landing! More troublesome, however, was that our rear trailer axle was bent and needed to be repaired. We decided to do this repair in Bangor, Maine, and have described the event here. You mention that some recommend driving the Cabot Trail counter-clockwise to keep the shore on your driving lane side (good advice also for places like the Oregon coast). I’d like to add one other reason for doing it CCW, especially for those planning to do it all in one day. For those interested in photography, starting early in the morning means that you will always be on the “sunny side” of the peninsula as you drive up and around the the coastline. This means better lighting for shoreline photos as well as being properly oriented for those great dawn shots over the Atlantic in the morning while you’re on the east side and sunset shots in the evening when you’re on the west side, looking out at the Gulf of St Lawrence. We actually did it clockwise ourselves, but we started the our loop around the Cape Breton Peninsula late in the day so we were on the west side in the afternoon. We spent the night at the Hideaway Campground at South Harbor on the north end of the peninsula, then drove down the Atlantic side the following morning. All great advice, Jim. In our case, we had clouds all day so the sun didn’t rise or set and it didn’t matter which direction we were driving! Thanks for all the detail!